I seriously want to give bearz a huge round of applause for Cassandra Gemini. I was blown away when I saw that on the release list. This. How many years did that take you? A great week of releases. Just a comment on "(I've Had) The Time of My Life" why are the female parts missing when playing solo vocals? C3 has done other duets where all/most of the lyrics are in solo vocals. Apparently Cassandra Gemini is too long for Phase Shift to handle. Can anyone make it into two parts so that its playable in Phase Shift? Also are any updates to song charts also updated for the Phase Shift links, since Supper's Ready doesn't have keys for me. Apparently Cassandra Gemini is too long for Phase Shift to handle. How so? What happens? Have you notified the Phase Shift devs? There's no real reason for it to have a problem with a 32 minute song. What happens is that it loads the song before you start playing and after 10 minutes of loading it just says that Phase Shift has stopped working. And I posted to the Phase Shift forums and someone said that around twenty minutes is the limit although songs like Octavarium work just fine. It's important for PC software to enforce limits like that, because otherwise it would use too much memory! Wierd. I use FoFiX (can't get Phase Shift to run worth a damn) and can play songs like "The Twelve Step Suite" by Dream Theater and "Light Of Day, Day Of Darkness" by Green Carnation without a problem. (They take a little bit longer to load but once they play, it's smooth). When I saw Cassandra Gemini on this list, I had to do a double-take because I didn't know that that would be possible to run in RB3. Whenever me and Sideshow were converting the full-band Dream Theater songs that I charted (available on his thread), he mentioned something about "In The Presence of Enemies" potentially "stretching the game to it's limit," even though that song is 7 minutes shorter than CG and I didn't chart Pro Keys or Harmonies. This honestly makes me want to play some (on FoFiX because my copy of RB3 doesn't work anymore) before RB4 comes out. It also makes me glad that I nominated BearzUnlimited and Farrotone for the "Favorite Charter" award. As for other songs, the Judas Priest, Tenacious D, Sabbath, Boston, Bowie, and Rishloo tracks all have me excited. It's just that at one point I was considering doing all of the Frances The Mute album, but I was just starting out with charting at the time and I said "Okay, let's tackle the big monster first!" Cassandra Gemini ended up overwhelming me so much that I stopped for a while and never got back to the Frances The Mute charts. And with my classes in college right now, I have no time for charting anymore. Seeing "Never Say Goodbye", Don't Look Back" and "Golden Years" all sitting there in a row just reminds me that C3's releases are going away. Then I remember seeing "(I've Had) The Time of My Life" back near the top. Makes me a sad panda. Well, going to get these songs and cheer me up with some Customs! Thanks again to all the authors who released these 18 songs! This is a Xbox 360 community. Conversions for other platforms are done as a courtesy but with no guarantee. In this case, the problem is caused by Phase Shift. Take it up with the Phase Shift devs or learn to do what you want to do and do it. The designated Phase Shift person for C3 will not be doing that for you. "In the Presence of Enemies" has 95,981 notes authored. This song did give me an error in Magma that there were too many events. I chopped the hell out of the lower difficulties to get the song to compile. "Cassandra Gemini" has 123,115 notes authored which is just crazy talk. Kudos to getting that song to compile with legit lower diffiiculties. I wanna say that most of the entire Mars Volta discography has been charted on drums over at FOF. I never really got into this band but am interested in tackling those conversions in the future. Oh god yes, I'd be so on board for more Mars Volta full band. Just be aware most of those customs have lax tempo mapping that needs to be fixed. Is there some sort of 20 minute limit on songs that causes the game to crash? The same thing happened with Octavarium, but not Swim to the Moon at 18 minutes. Numerous people have reported those 30+ minute songs crashing around the scores screen. Probably has to do with the insane amount of notes authored in those songs. Even the officially released Rush 2112 I remember crashed sometimes at the end if you play full band. Probably just a limitation in memory for the Xbox360 or Harmonix didnt code the game to be able to handle large amounts of scores. I mean we do have that 2952 song limit so yeah were probably just pushing the hardware limitations which shouldnt be a problem with RB4. I havn't looked at any of those tempo maps for The Mars Volta songs over at FOF. That surely is a project to undertake at some point. Magma has a feature that allows you to compile with a "dummy" midi and then replace the midi in the compiled CON with an "override.mid." I'm pretty sure that Magma checks for all other MIDI errors before telling you it's too big - I think I remember fixing errors in drums reductions, when those (and animations) are what I took out for the dummy mid. However, when I went back just now to check for sure and selected the midi in the Game Data tab, Magma told me it was too big and compressed it for me so it would compile. I don't know why that feature didn't activate the first time, but apparently it's there. As for the Phase Shift concerns, I'm not sure if there's a simpler way to split the song in two parts. It seems like it would be difficult to deal with readjusting the tempo map and audio. Sorry you guys aren't able to play it. I don't know why that feature didn't activate the first time, but apparently it's there. The feature is there thanks to raynebc's midishrink tool. But that's only used when it's time to compile and it sees it's too big. And even then, it might not reduce the size too much. I've managed to get "Cassandra Gemini" to run in Dolphin under Wii restrictions. Very hacky methods, but I managed. Please tell me it works on the real console. Here's the final autoplay score on Guitar, so it is possible to make it to the end. Ah yes the dummy file trick. I remember doing that for the Whiplash drums custom that had BPM lower than 40. I've fixed up and added overdrive and pro to several of them, so if you need any just message me. 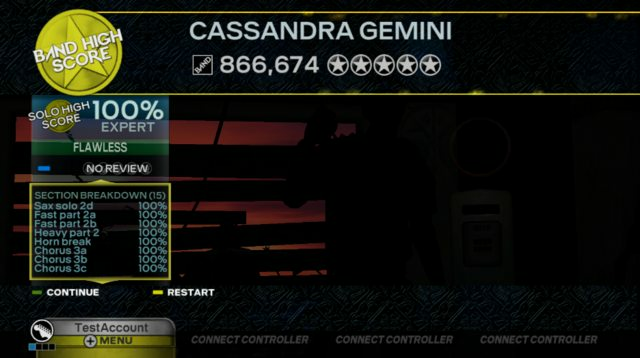 Decided to try out Cassandra Gemini on guitar, got a score of 843,048, and hit 6,699 notes.